The story behind the quote: This week’s quote comes from a very old comic but the saying still rings true, especially during these troubled times. This week’s quote comes from Captain America, who made a guest appearance in Daredevil Issue #233. In the issue, Daredevil is in the middle of a battle against the supervillain known as Nuke. Daredevil manages to take out Nuke but the Avengers, who were busy helping civilians during the fight, arrest Nuke afterwards. 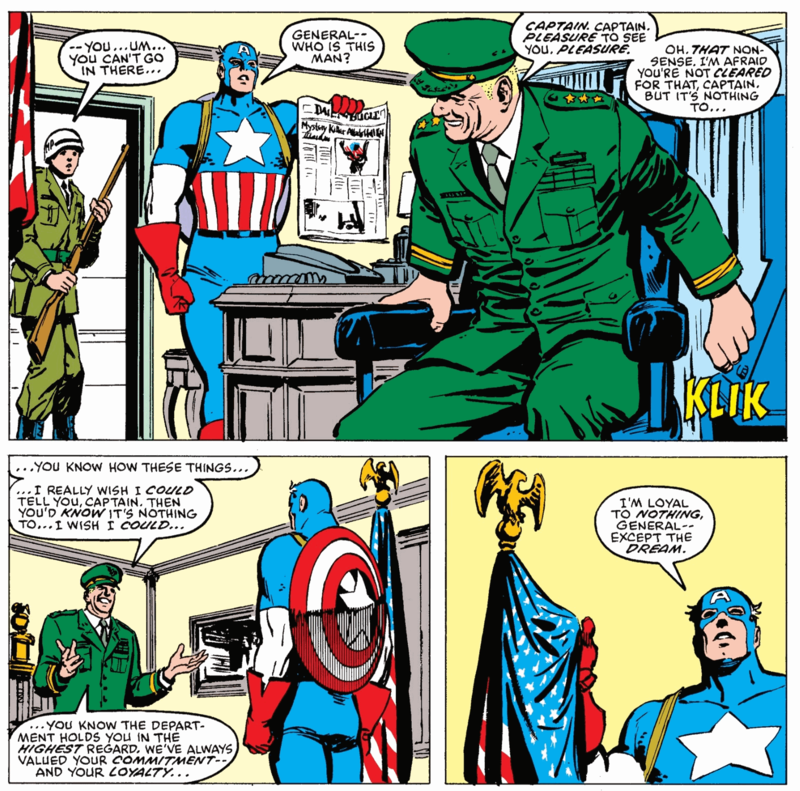 Later, Captain America meets up with Daredevil and the patriotic hero asks The Man Without Fear who Nuke is. Daredevil retorts and tells Captain America to ask his “superiors” (the US government) who Nuke is, as Nuke has the United States flag tattooed on his face. Captain America does just that and asks one of the generals who Nuke really is. The general hints that the information is classified and that, as a patriot and a good soldier, Captain America should stop looking into to. This is when Captain America delivers the quote while holding on the flag of the USA. Geek wisdom: People nowadays seem to be taking sides. It may be about political ideals on how people have become too conservative/liberal. Or it could be how one’s lifestyle is corrupting the world we live in and we denounce the “other side.” We are currently dividing ourselves needlessly because we all want the best for ourselves and everyone. The worst thing is that we become loyal to one “side” just because of our race, religion or party alignment without even taking a step back to think for ourselves if the “side” we’re on actually falls on what we believe in.